The Vuly 360 Pro is now bigger and better than ever! With expanded configurations and over a dozen new swings and accessories – including bounce swings, monkey bars and options for soccer and boxing – customisation options are endless. The incredible two-storey cubby house module that transforms a regular swing set into an all-star play set even includes a sand pit and climbing rope and tent! With a free Shade Cover for all sizes, 10-year frame warranty and Good Design Award pedigree, the possibilities are endless. Shoot hoops like never before, on the most sophisticated portable basketball system available: the Vuly Slam Pro. Its unique self-raising and gas-powered height adjustment mechanism allows you to fine-tune the ring position, up to NBA standard, at the turn of a switch. 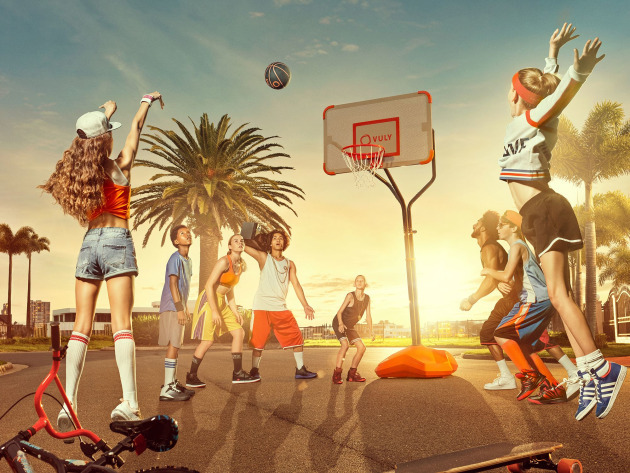 With the only only full steel backboard in Australia, it’s perforated, double-galvanised, powder-coated and electroplated – making it stronger than acrylic and glass.The rebound is exceptional, and when it comes time to slam dunk, the multi-directional hoop gives feedback from all angles! It’s backed by a 7-year warranty and includes a free ViperGrip basketball – with superior control – and two pumps.